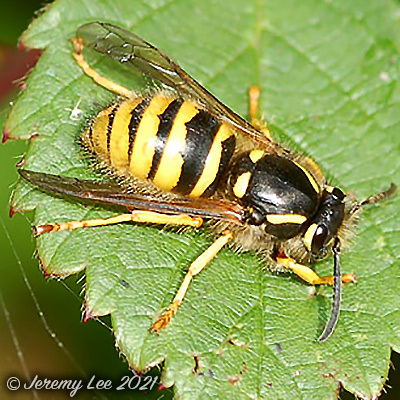 Despite being called the tree wasp, Dolichovespula sylvestris builds both aerial and underground paper nests, and can be found in rural and urban habitats. It is locally common and can be very aggressive to perceived predators, including humans. About 22 millimetres in length, the face of this species is usually clear yellow with a single dot. The antennae are yellow at the base. Thorax with lateral hairs and two posterior yellow spots. It builds its nest in trees and other aerial sites as well as underground. Around 20% of nests are constructed underground but normally near the surface in a pre-existing cavity, as opposed to burrowing. Aerial nests have been found up to 8.3 metres off the ground, usually in enclosed spaces such as bird boxes, hollow trees, cavity walls etc., although exposed nests have been found in places where they are sheltered, e.g. in buildings. The flight period begins in March and lasts into September.